Remember the adorable Bengal tiger cub who was rescued from a smuggler last month? He now has a new best friend - a Sumatran tiger cub who was rejected by his mom. An incredibly sweet, absolutely heartwarming video shared by the San Diego Zoo Safari Park, where the two now reside, shows them meeting for the first time. According to the zoo, the Sumatran tiger cub was born at the Smithsonian's National Zoo in Washington, D.C., US, in July, but was rejected by his mother. On September 12, he was brought to San Diego as a companion to the baby tiger who was rescued while being smuggled from Mexico to the US. 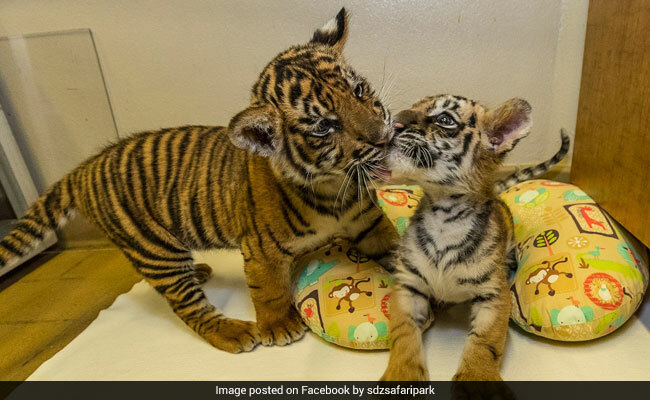 The 9-week-old Sumatran tiger cub and the 7-week-old Bengal tiger cub are now adorable playmates. "The cubs took to each other immediately, and interacted by wrestling, jumping and engaging in a lot of friendly roughhousing-things tiger cubs do," says the zoo. On Facebook, their video has been viewed almost 8 lakh times - and very much counting. "So delighted these two cubs can be playmates and learn to be tigers from one another!" writes one commenter. "That is the most heart-warming thing I've seen all day!! So glad these two can grow up together," says another.